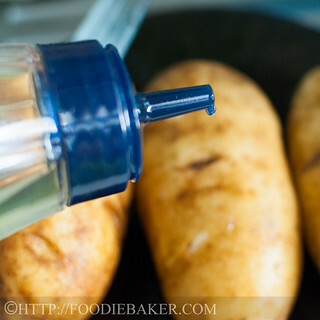 3) And rub it all over the potatoes 4) Place on baking sheet and bake for 1 hour or until softened. 7) And into a bowl with some butter 8) There will be some sacrificial potatoes. 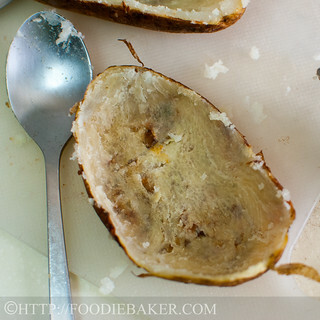 9) For the rest, leave a border of potatoes int the shell. 10) Grab more butter! 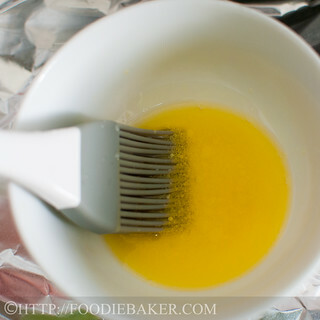 11) Brush the insides with melted butter. 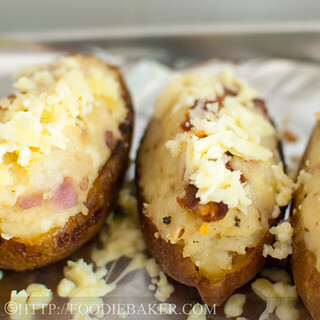 12) Bake the potato shells for 10 minutes. 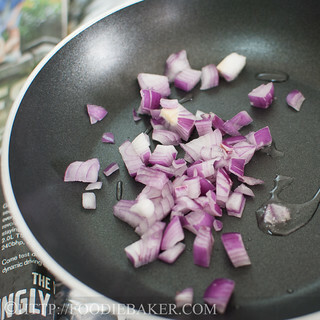 15) Pan-fry some chopped onion as well. 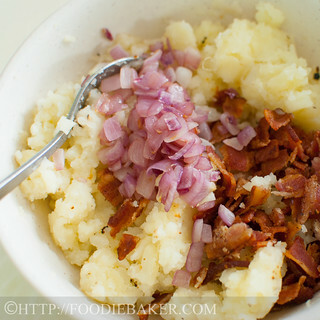 16) Dump the onion and bacon bits into the potatoes. 17) And some yummy cheese goes in for the fun. 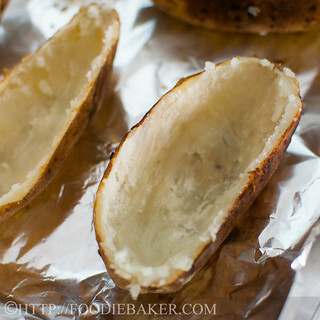 18) Scoop the potatoes back into the shells. 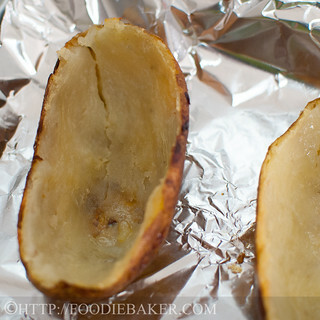 19) Bake until the potatoes are heated through. 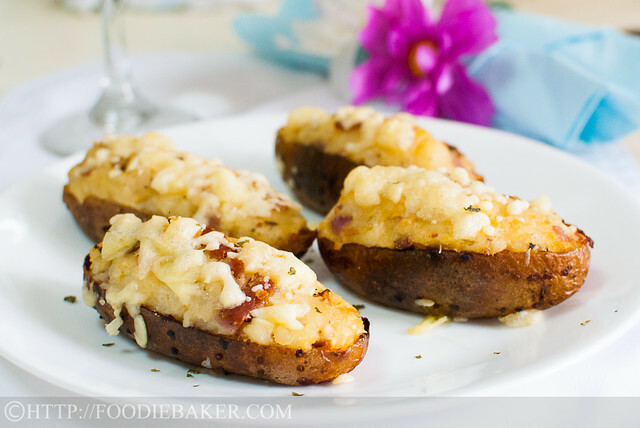 20) Top with more cheese and bake away! I especially love them with meat – chicken, steak, meatballs… take your pick! Preheat the oven to 225 degrees Celsius. 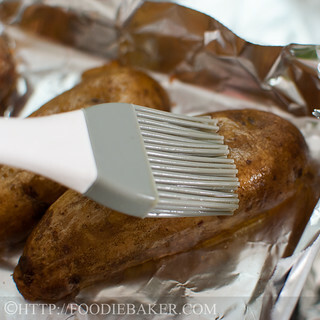 Line a baking sheet with aluminium foil and set aside. 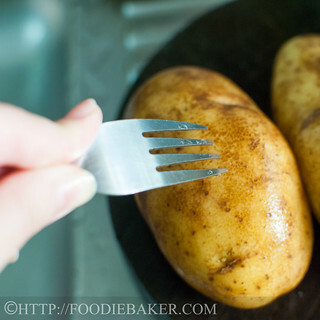 Using a fork or a skewer, poke holes all around the potato to release the steam generated during baking. 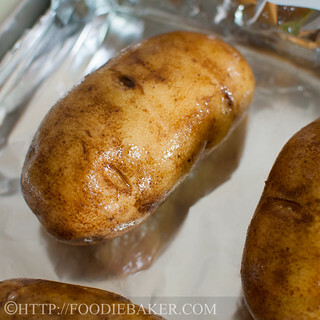 Rub olive oil all over the potato and place it on the lined baking sheet. 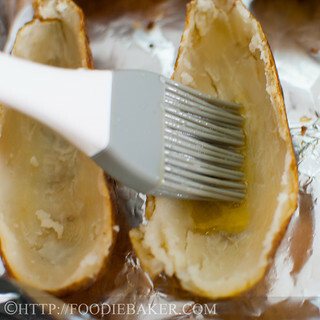 Bake for 60 minutes until a fork can be inserted into the potato with little resistance. Remove the potatoes and reduce the heat to 200 degrees Celsius. 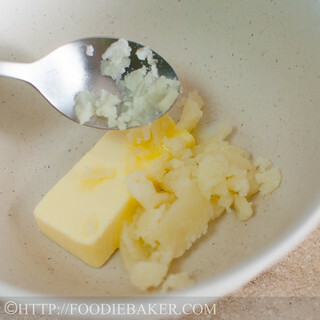 Melt 1½ tablespoons butter. 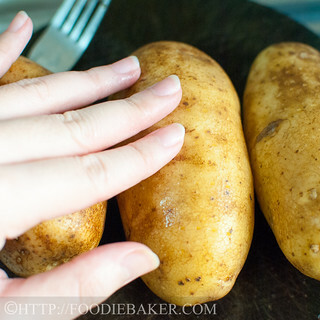 Using tongs / clean kitchen towel, cut 2 potatoes into half lengthwise. 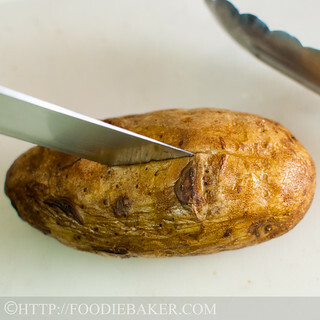 Scoop out the potato flesh of 4 potato halves, leaving a thin layer of potato in the potato shell. Place them back on the baking tray, brush the insides with the melted butter and bake at 200 degrees Celsius for 10 minutes. Turn the potatoes over, brush with more melted butter and bake for another 10 minutes until the shells are hard. Remove the potato shells from the oven and set aside. Reduce the oven heat to 190 degrees Celsius. While the potatoes are baking, place a frying pan on medium heat. 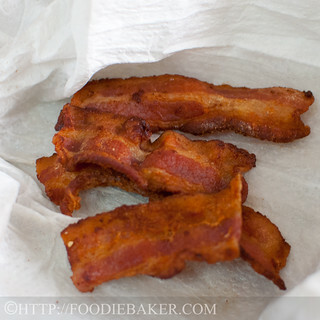 Add in the bacon fry until browned and crispy. Remove from heat onto paper towels to drain. Once cool enough to handle, crumble the bacon into small bits. Reserve 1 tablespoon of the bacon fat and discard the rest. Heat the reserved bacon fat over medium-low heat. Add in the chopped onion and stir-fry until the softened. Remove from heat and let cool. Scoop out all the flesh of the remaining 1 potato and discard the skin. 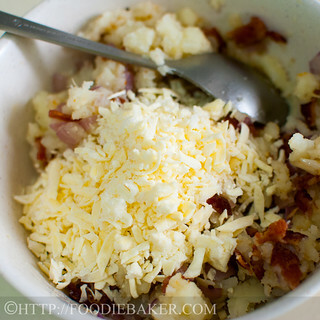 Combine the potato flesh together with the remaining 1½ tablespoons softened butter, bacon, onion and ½ cup of cheese. Season well with salt and pepper. 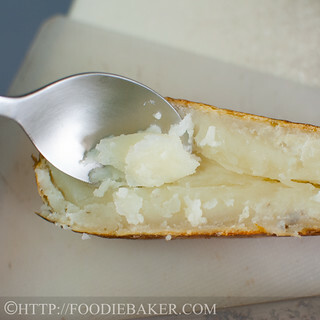 Scoop the potato filling back to the potato shells and bake for 10 to 15 minutes until warmed throughout. Top with the remaining ¼ cup of cheese and bake until the cheese has melted (and golden brown if desired). Super Naggy: I used Emmental cheese but you can use any other cheese – Swiss, cheddar, mozzarella. I also used 3 potatoes to make 4 potato shells so I can “overfill” them, which, in my opinion, made them look prettier. 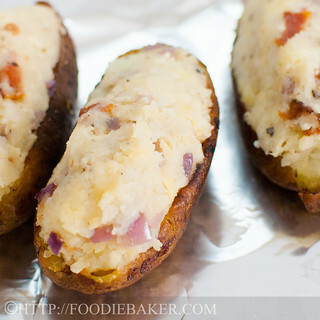 This is great recipe, your potatoes look so yummy, I have to try to bake them this way. And I bet those skins were incredible. 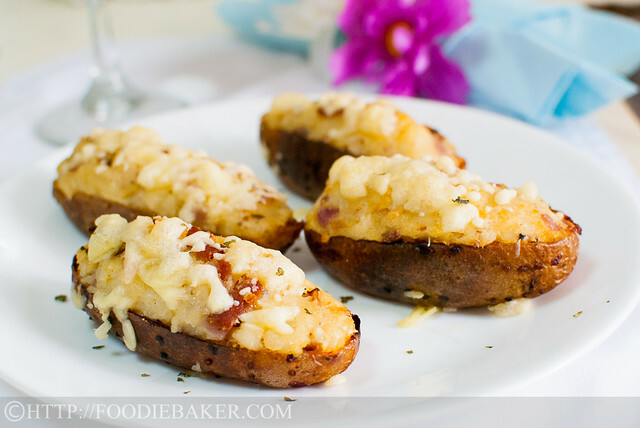 I love twice baked potatoes, such great comfort food for any time of year. 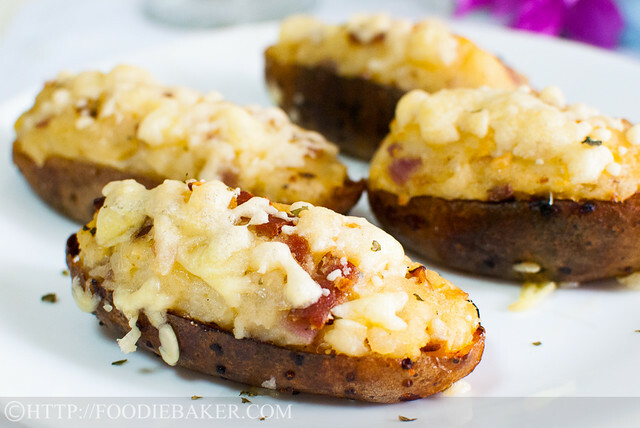 I don’t know why I never make twice-baked potatoes because they look so good! 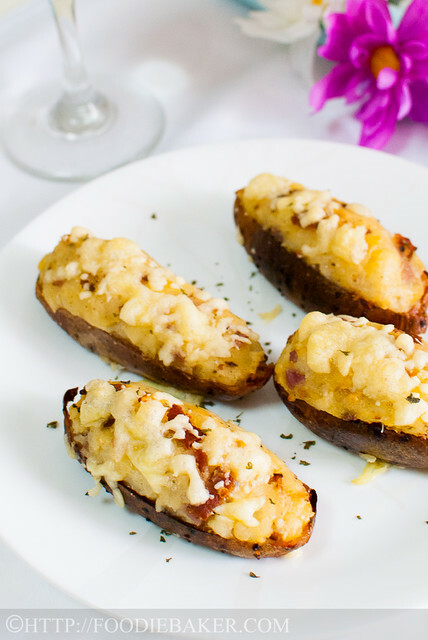 Twice-baked potatoes were a treat Mom prepared on special occasions, not necessarily the big holidays but suppers of some importance. And did we love them! Yours here, with the onions and bacon, must be delicious. Yes, they’re a bit of work but these would certainly be worth the effort. Thanks for sharing, Jasline. Wow, do those look good. 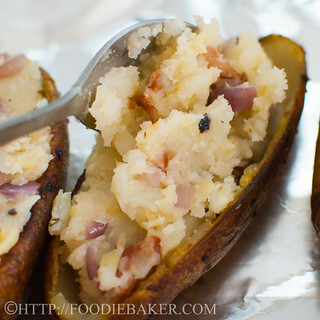 I also love potatoes, they are so versatile and delicious. Twice baked are extra good with all the additions. Your potatoes are looking so yummy! I would not mind having these as my main! haha! I am a potato gal!